At Arizona Copiers, we understand that purchasing a copier, or committing to a long term lease, is not always the best solution for a company. If you have a project that requires a large volume of document production, don’t turn to an outside printing company- Arizona copier rentals are an effective way to take care of all of your document service needs in-house, without having to put up the large amount of capital required to buy a high quality copier. Arizona Copiers is a copier rental company in Arizona that gives business owners the option to rent, rather than buy or lease, a copier that has a number of features, from the very best brands, such as Konica Minolta, Toshiba, Kip, Muratec, Lexmark, and Hewlett Packard. 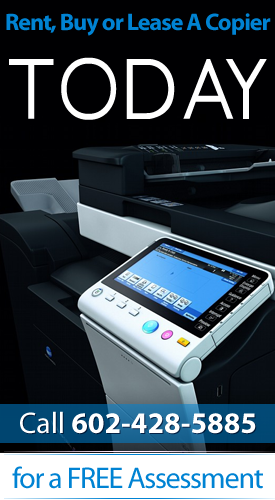 Copiers today are designed with a number of amazing features, including high resolution prints, vibrant color printing, incredible printing speeds, and scanning and faxing capabilities. When you choose Arizona copier rentals, you will be able to use a machine that can take care of all of your document needs for a mere fraction of the price of buying it. Not only is renting a copier less expensive than buying one, it is also a lot more cost effective than getting all of your copies, brochures, and other advertising material printed by an outside company. We take great pride in being the top copier rental company in Arizona, and we provide the highest level of customer service and support to ensure that we will remain the first choice when it comes to copier rentals! When you rent a copier from Arizona Copiers, you will be able to choose from the best brands and models on the market. After you choose the perfect copier to meet your company’s needs, we will give you continued support and service. Have a question about your machine, or need troubleshooting help to solve a copier issue? Just give us a call! We have years of experience in providing Arizona copier rentals, and we have no doubt that we will exceed your expectations. No matter where you are located, we can fulfill your copier rental needs. Our services are available across the Valley of the Sun, as well as throughout northern and southern Arizona. Please contact us today to set up your copier rental- we are confident that our copiers will save you time and money in your office.